Earlier this year Chris McClement was appointed as APNK and Kōtui manager, but who is this mysterious man at the helm of APNK? By way of introducing him to our extended People's Network whānau, we thought an interview might be appropriate. In last week's post I mentioned that during one of our recent aftershocks, while on helpdesk duty, Keiran tweeted from underneath her desk to say that... well, she was underneath her desk, thereby alerting the partner libraries that follow our account that there was a bit of an issue and that she might not be able to answer the phone just at the moment. Would she have been able to send an email, or update the status page on our website from there? Well, no, she wouldn't. While APNK staff have access to laptops and desktop PCs that are excellent methods of communication in most instances they don't really cut the mustard for "below desk" messaging. That's one of the reasons why Twitter can be a very handy way of communicating since tweets can be sent from a mobile phone. That's why, if you're interested in keeping abreast of APNK, and staying in touch (even during an emergency) then following our Twitter account is probably a good idea. Keiran joins the office worker exodus after Monday's 5.7 and 6.3 quakes. Well yet again the APNK team found themselves in the midst of disruption, ructions and sand volcano eruptions this week with double-barrelled 5.7 and 6.3 magnitude quakes doing their best to disturb the peace on Monday afternoon. Unless you're in the building industry there's not many times in your life that you get to don a hardhat and go into a condemned building, but that's just what several members of the APNK team did earlier this week. It’s now 11 weeks out from 22 February and probably time for a bit of an update on what’s been going on with the network and the team. When the 6.3 magnitude quake hit last week the APNK network, which supplies internet to libraries and a few marae up and down the country, our network went down for half an hour immediately afterwards, despite the fact that there was no power in the central city, APNK headquarters was evacuated and has since been assessed as unsafe, and our staff were forced to scatter as everyone tried desperately to get to their loved ones as soon as they could. 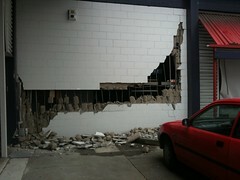 On Tuesday 22 February Christchurch and surrounding areas were shaken by a severe and destructive 6.3 magnitude quake that cause serious damage and/or destruction to much of the central business district.